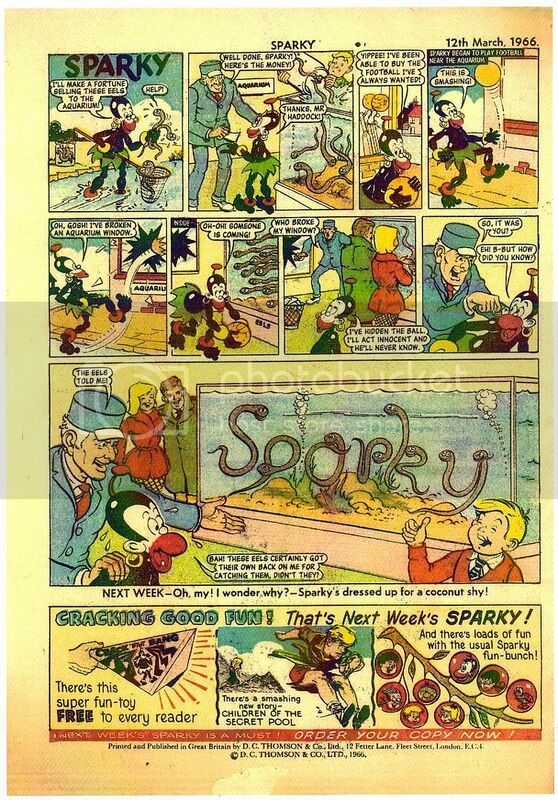 Comics UK - View topic - The Sparky File 1965 to January 1969. The Sparky File 1965 to January 1969. Re: The Sparky File 1965 to January 1969. Just to say folks! 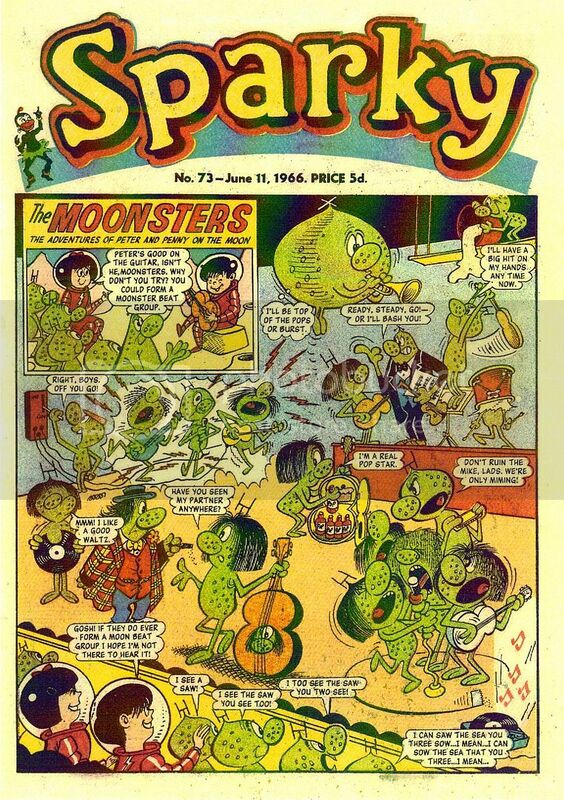 I just won a few 1966 and 1967 Sparky's (Arrived today) I need to catalogue them to my `word` file, so I won't have time to put up another edition listing till about Saturday! I can't stay on line too long, so please bear with me as I want to make this file as thorough as I can! And now the next issue line up! This issue saw something of a `re-vamp` to the comic. Issue 35 saw the first Logo change. It was the colour red in the word Sparky, which now changed place with the yellow surround. Hence, Sparky in yellow on a red surround. The blue background stayed the same though. The comic gave away a free gift; the `Squeezy Wheezy` balloon. `The Moonsters`. They swapped places with the `Sparky` character, who now took over the back page. The Moonsters decide to make a film. `New Story`. `Gilpin, the Lost Boy`. A strange offering this! Set in the 16th century, it concerned the adventures of a `sprite` (Gilpin) who had a spell placed upon him (by whom it was never revealed) that compelled him to become the servant of the first mortal he met. Gilpin looked human except for his large eyes. He possessed some magical powers to help him in his tasks. I donâ€™t have enough Sparkies to figure out what the story was all about! A very puzzling affair indeed! Top two thirds are an advert for next weekâ€™s free gift, the `Spin Din` (illustrated). 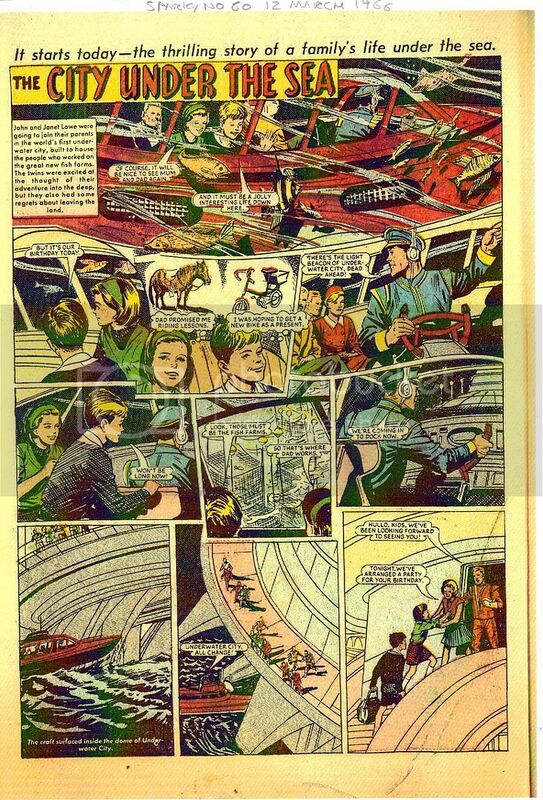 The bottom third of the page showcases both this weeks new stories `The Year of the Vanaks` and `Gilpin, the lost boy`, with a panel from next weeks adventures in both. `New story`, `The Year of the Vanaks`. This was another space invasion, but in a much more serious mode. In full colour, we see an advance guard of crimson robots who prepare the earth populace for the arrival of their masters; the Vanaks!. These turn out to be about four foot tall with large bulbous heads. They are bright purple in colour. `Watch` This was the final episode. `New story`, `The Flood that Mother remembers`. This story featured a coastguard and his family who were stationed in Southampton in 1953. I think it was loosely based on the true story of the great flooding of 1953. `Dreamy Dave and Dozy Dora` The pair find themselves in `Topsy-Turvey` land. 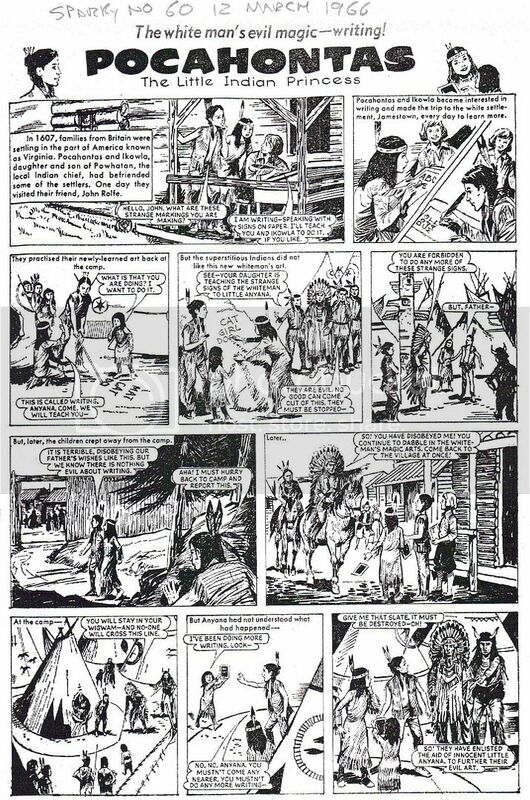 For the first time, the strip was moved away from the centre pages and was now illustrated in black and white. `Freddy the Fearless Fly` Bottom of the page â€œNext week; Jeff Ye Jolly Jesterâ€. Top three quarters, `Sparky` Who was now on the back page. 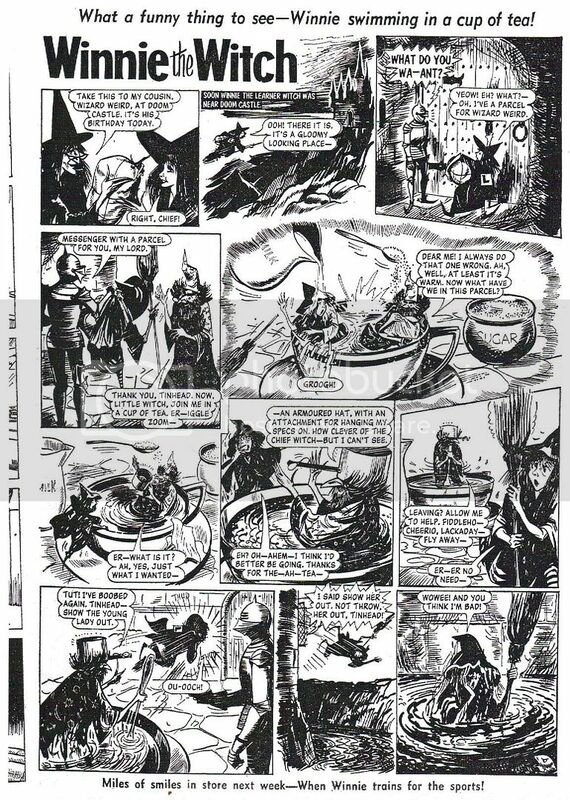 Bottom quarter of the page was devoted to illustrated advert for next weeks new story `Floating Along, Singing a Song`. The adventures of a musical family; who live on a canal barge. Issue 35 was the first in a series of `re-vamps` for the comic through the sixties. It probably gave away more free gifts 1965 to 1969 than any other Thompson comic in this period. My guess for this move was due to none too healthy sales. Searching through some old research notes this weekend I came across a contents index I must have prepared years ago for the complete run of the Sparky Book 1967-1980. If anyone wants the odd detail from this just let me know. 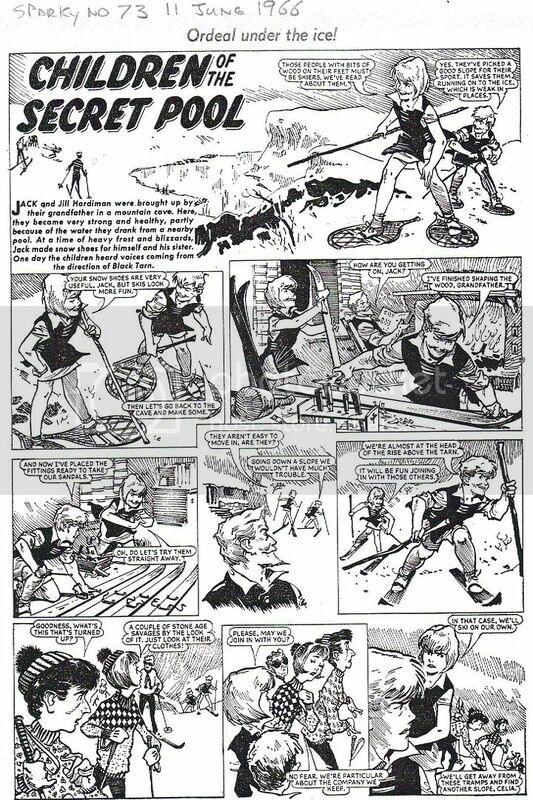 Sparky strip reminded me of this..
well spotted, PETER! I wonder how often so obviously-recycled storylines were used like this? These must have been about 3 years apart, at the time of artwork being prepared. Here's the next line up! Page 1 `The Moonsters` Peter takes Penny to a Moonster resteraunt for her birthday treat!? `The Downside Donkeys` This story concerned a family who ran a donkey sanctuary. Yet another animal based story in Sparky. `Dreamy Dave and Dozy Dora` Television images come to life! This would be a often repeated storyline in this strip! `Top half` `Pansy Potter`. Bottom Half devoted to a two panel illustrated advert of Transistor radio or ten shilling order that could be won if you `write to Sparky`. Obviously, letters were only trickling in! `Minnie Ha-Ha, and `Running Kick` Caption at bottom of page: `Next week, `Hockey Hannah`. Top three quarters `Sparky`. Bottom quarter split into three panelled illustrated preview of next week stories; `Keyhole Kate`, `Cuckoo in the Clock` and `The Moonsters`. There really are some proper treats turning up in this thread! THE CITY UNDER THE SEA is lovely - a real 60s future idyllic utopian feel to it. Do you have any more of that one, ISPYSHHHGUY? BOY IN THE FOREST OF FEAR looks good, too. Quite a popular tradition in children's fiction and drama of the time - kids whose best friend is an animal or, in this case, lots of animals. DCT did a few plays on the theme of "lonely" lads, didn't they? I'd be interested to hear if any of these luvverly looking early serials - FLOATING ALONG, SINGING A SONG, THE CITY UNDER THE SEA, BOY IN THE FOREST OF FEAR, THE YEAR OF THE VANAKS, etc. made any appearances in the first few annuals, thanks. sorry, Raven, this is the only CITY UNDER the SEA material I have: glad you seem to like some of this stuff, however. 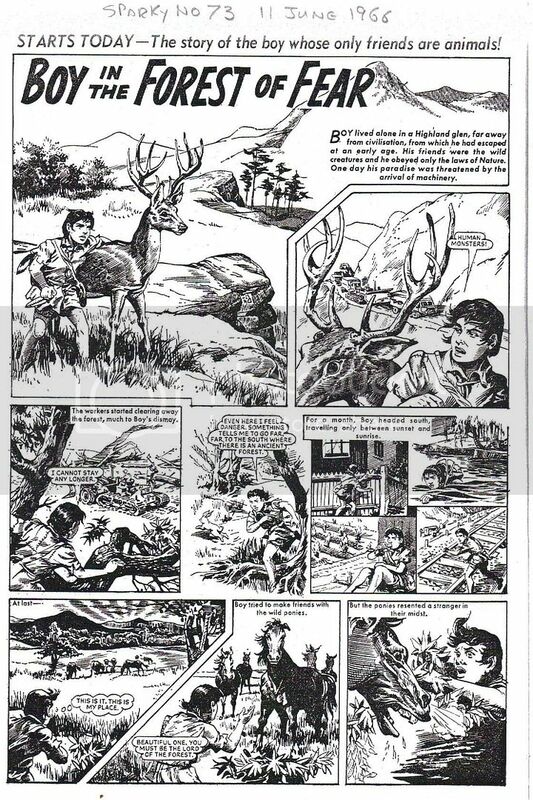 'BOY in the FOREST of FEAR' is another brilliantly-drawn, classy strip that is only really appreciated by the few who have the original comics [loads of great stuff is never reprinted in any format], and that is one reason this material is being put on here, so at least a few other comic fans can get a look at this stuff [which it deserves, in my view]. All these scans are from high-quality scans that Alanutron 05 has mailed me; sorry I don't have any more of the 'barge' story either.....maybe Alan can oblige? But any requests you have that I can help with, I will certainly put on here. Still a lot of good diverse material coming up, the idea is to give a decent basic representation of what SPARKY was like, up until the more familiar 1969 'change in direction'. ----------and lastly for today, page 1 of yet another richly-evocative strip [part 2 the morn.] All these scans originate from issue 73 [11 JUNE, 1966]. Hi Raven, Sadly all of strips mentioned were stand-alone tales and as such none of them made it into any of the Sparky Books. Mentioned him before but George Radcliffe was the artist behind 'Forest of Fear', Beautiful work. He also drew 'Watch' and the pony story 'Rory' for Sparky at about this time. He was in the main a girl's paper artist but he did do the odd item for the boy's papers too e.g. the Victor strip 'The Bomb with the Purple Stripe'. Ah well, I thought there may have been the odd sequel! Thanks for letting me know. Next listing brings us into 1966 now! `The Moonsters` Moonsters go motor racing. New story! `Pocahontas` The tale of the Indian Princess in Virginia circa 1607. `Dreamy Dave and Dozy Dora` The pair find themselves in `Musical Instrument land`. `The Year of the Vanaks` Final episode where Earth people turn the Vanaks own weapons against them and kill the Vanak leader with Formic acid. `Will O` the Well` This character (Will) had now returned in illustrated format rather than text. Not quite the sense of wonder that the text stories had evoked. `The Quest of the Wandering Wingates` Medieval adventures of Norah and Dickon Wingate in the `Holy lands`. Top half, `Pansy Potter`. Bottom half, two panels. Left panel is â€œWin A Transistor Radio When you write To Sparkyâ€. Right panel, â€œFree In Bimbo, A `Pip the Penguin` glove puppet. Top three quarters, `Sparky`. Bottom quarter, preview of next weeks new story, `Lonely Wood`. Next line up, also from 1966! `The Moonsters` All go parachuting with hilarious results! How can you go parachuting on the Moon? `New story! `Seven at one blow!` The adaptation of the old tale about the tailors apprentice. New Story! `Huffy, Muffy and Tuffy`. The comic adventures of a family of bears who live in South American rainforests. Yes! Yet another animal based strip. Top two thirds of page is an illustrated advert for next weekâ€™s free gift, the â€œCrack-Bangâ€. That description would give a different mind picture today! Bottom third of page is an illustrated preview of next weekâ€™s new story, `Children of the Secret Pool`. New story! `The City under the Sea`. 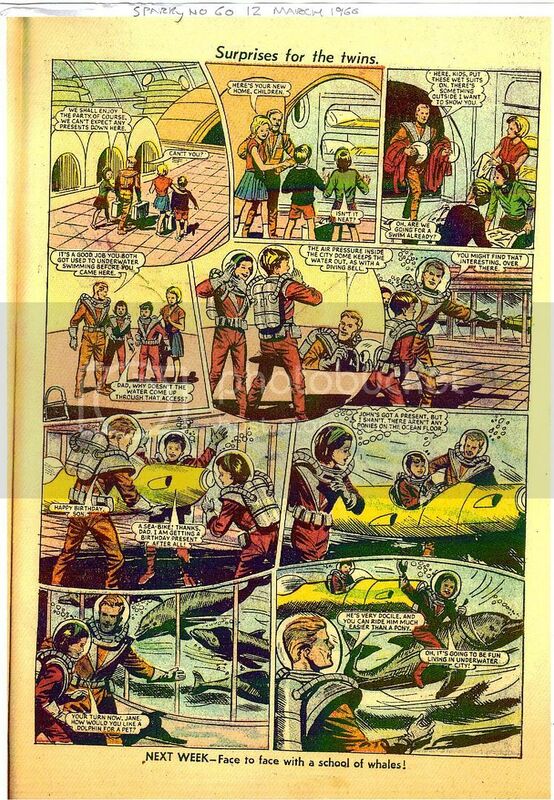 This strip features the futuristic adventures of two children. They live in an underwater city and its adjoining fish farms. `Dreamy Dave and Dozy Dora` In telly advert world. `Pocahontas` The adaptation of the story of the red Indian chiefâ€™s daughter (Pocahontas) that was set in Virginia in 1607. `Goldie`. Yes! Another animal based story. This strip relates to Steve and Betty Martinâ€™s pet golden eagle, `Goldie`. Not sure if this was before, or after, the actual escape of real-life `Goldie` from London Zoo. Top three quarters, `Sparky`. Bottom quarter is a three panel illustration. Left panel is the â€œCrack-Bangâ€ free gift. Middle panel is a preview of next weekâ€™s new story, `Children of the Secret Pool. Right panel is a group illustration of Sparky characters awaiting readers in next weeks comic.